And thus began nearly every early conversation I had with coworkers and friends about my “plan” to bicycle down the West Coast in September of 2010. As of August 1, I had no bike, no route, and no gear. But exactly one month later I found myself rolling my precariously laden bike (total weight of bike + gear = 81 lbs) down the residential streets of the Point Grey neighbourhood in Vancouver, unsure, for the first of many times during the trip, where I would sleep that night. Starting off with 2 friends and 1 relative stranger that day in September, I had no idea that by the middle of December I would find myself with beefy thighs and a mean shorts tan, posing for pictures with my father at the Mexican border having traversed over 3200 km, more than 1000 km further than the original itinerary. What happened along the winding roads, smooth bike lanes, glass-strewn freeways, and rocky dirt paths of British Columbia, Washington, Oregon and California, you ask? The answer, like so many of my responses to people I met along the way, is simple: adventure. So pack your panniers, shimmy into your padded bike shorts, don your helmet, and let me tell you a few tales from along the way. As we left Lauren’s apartment that first day of September, after a hectic week of arranging to have our ‘real’ lives put on hold for four months, 3 trips to Mountain Equipment Co-Op for gear, some frantic bike assembly and maintenance, and a variety of last minute panic inducing occurrences (losing a contact lens, getting health insurance), we truly set out into the unknown. While we had with us a guidebook and a wealth of equipment, we lacked, among other things, the following: a) basic bike maintenance knowledge b) anything other than rudimentary biking experience c) fitness. 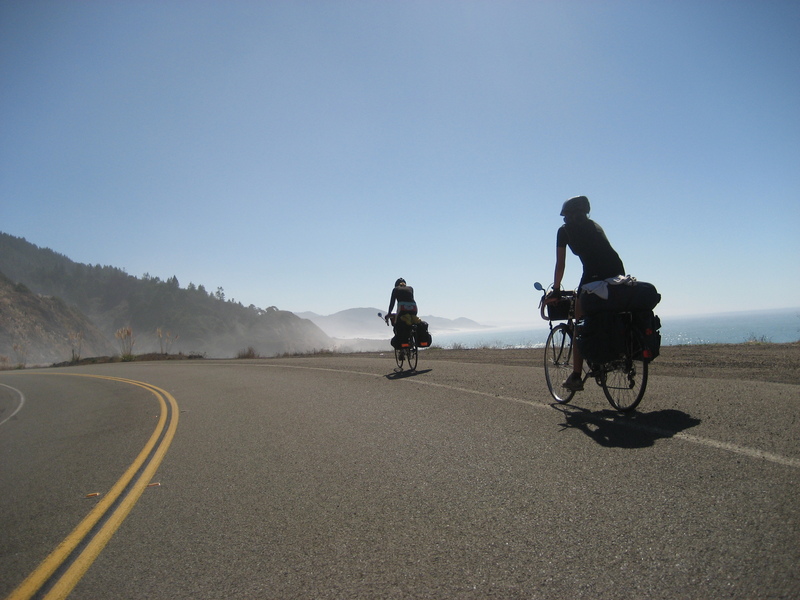 The premise was that we would just have to see how far we could bike each day, and go from there. We rolled (teetered) out onto the street, many hours later than planned, riding our weighted down bikes for the first time, trying to get used to clip in pedals and spandex shorts, questionably functional brakes and painful seats. After a few wrong turns (“We’re already getting lost and we haven’t left Vancouver yet!”), some surprisingly strenuous sections of coastal road after Stanley Park, and a joyful reunion with Miranda who somehow managed to lose the group for upwards of half an hour, we were ready to board the ferry and make the crossing to the small town of Gibsons. Exhausted after our frantic first ride, we lay strewn about the surprisingly plush seats of the ferry, eating tuna directly out of cans and warding off disgusted looks from well-dressed commuters with our impish grins and personal justifications that if you are carrying everything you own on your bike, you can get away with most things, a feeling that would certainly fuel many escapades later on in the trip. That night, riding off of the ferry into very unfamiliar territory, we began to feel the first hints of fear that our general unpreparedness was catching up to us. It was pitch dark, we only had 2 functioning lights between the four of us, and we were miles from the nearest campground. We decided to take a sideroad that we hoped would have access to some open but secluded space where we could pitch our tent for the night, but all we found were walls of thick bushes and steep driveways lining the road that hugged the edge of the coast. Eventually, Lauren and Emma decided that we needed to take a more direct approach and simply ask someone if we could sleep on their lawn. They did just that and within minutes they triumphantly returned, showing us our very own piece of land on George and Jennifer’s front lawn upon which we could pitch our tent for the night. I was sceptical that someone would be so kind to four grubby-looking, sweaty bikers and in the back of my mind expected some sort of horror story ending in axe murder about to befall our humble bike team. But we were exhausted and quickly fell asleep after what would turn out to be one of our shortest biking days on the trip. The days rolled on and we found ourselves meeting other touring cyclists, fielding queries from interested locals, and attending to Miranda’s many flat tires. We settled into a rhythm: wake up with the sun, ride the curve of the coast, and tumble into our tent for 10 hours of sleep so we could do it all over again the next day. 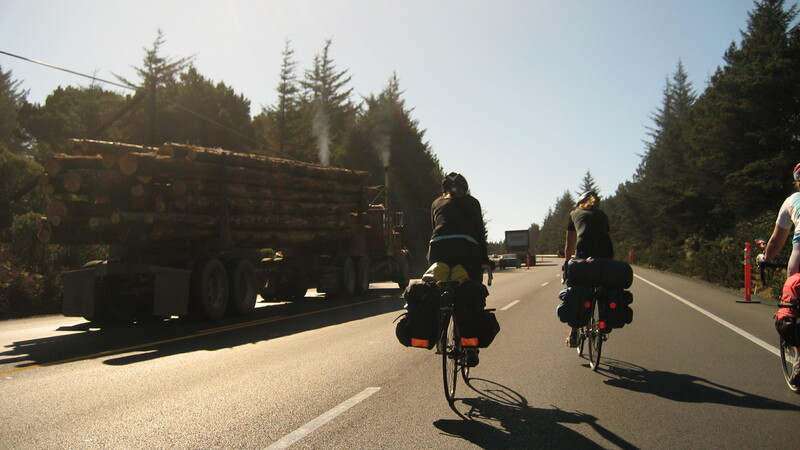 As our tans deepened, our quads rippled, and our butts ached, we inched our way through Washington, about 80 km a day. We felt strong, adventurous and unstoppable. And then it started to rain. And rain. And rain some more. After a damp day of thick, wet fog that settled on the road, making the surface slick and the visibility poor, we were eager to stop for the night in the town of Westport. Throughout our time in Washington, we had been particularly struck by how, um, rural, the state was. It might have been that most ‘downtowns’ we cycled through were populated primarily with buffalo jerky and fireworks vendors, or that 80% of vehicles that passed us were trucks with mangy, barking dogs in the back, but Washington was beginning to lodge certain stereotypes into our minds. I was particularly concerned with the large hand-drawn poster outside of a store proclaiming: “We love God, the Consitution [sic], and the Tea Party.” But as we pulled into Westport, things were looking good. Spotting a library as we rode through town was the first good sign, it had been way too long since we had seen evidence of literacy. We pulled off the road and alighted upon the “Totem RV and Trailer Park” where we paid $20 and were shown to our campsite, a barren patch of gravel in the corner of what appeared to be a parking lot. We set up our tent close to the chain link fence, having been warned by the owner that he could not be held responsible if an RV ran us over in the middle of the night, unaccustomed as the trailer park was to people in tents, not to mention people in tents who had no car with which to set up as a buffer between their tents and certain death. After struggling to get our tent pegs into the hard ground, we stepped back and surveyed the scene. Through the thick fog (and the impressive stench of fresh fish) we could see in front of our tent a row of squalid-looking trailers, complete with stacked tires, overgrown grass climbing up the sides of the dilapidated mobile homes and hemmed in on the left side by the smouldering remains of a stripped-bare RV, the remnants of which were clearly being used by our fellow RV park neighbours to fuel an impressive bonfire. My defences were up, I was clearly out of my comfort zone and once again felt the forbidding doom of impending axe (or maybe shotgun) murder. But this time, I was slightly more emboldened and decided to go talk with the people sitting around the fire, if for no other reason than to get a working description of my soon to be killers. But the people I had stereotyped so brutally refused to play along with my assumptions. We had a pleasant chat about life in the trailer park , how it was cheaper than renting in the town and that you couldn’t be closer to the docks where a few of the men had jobs. If you could put up with the hot water being turned off at 9pm, and the less-than-scenic view in exchange for being able to live with your family, close to your work, then what was the big complaint? My new friends clinked their beers, joked about our tiny tent, and turned back to their roaring fire. Turns out happiness can thrive where I would least suspect. The rain continued unabated as we continued south towards Oregon. We once again found ourselves soaked to the skin with no plan for the night as we rolled into Raymond, Washington. Through some stroke of luck, Emma had written down the numbers of some CouchSurfing hosts the last time we had Internet access and one of them was located just outside of Raymond. We made the call and were soon on our way to Chandra’s house. Upon our arrival, we were welcomed into our new digs by Chandra and her 15 year old son, Elijah, and promptly given warm bowls of soup, the use of their washer and dryer, and glorious, hot showers. Chandra, we learned, was a bit of an outsider in Raymond. Her meditation and yoga courses were slow to receive positive attention as her neighbours were rather traditional Christians with a disdain for anything ‘alternative.’ Chandra, her husband and Elijah had also just returned from a 7 month journey around the world. The adventurous upbringing shined through in Elijah, one of the most confident and kind teenagers I’ve ever met. After an evening of travel stories, a movie, and guitars, we tucked into bed; our spirits once again overflowing with trust in strangers. We finished off our time in Washington with more rain, a coincidental meeting with a man walking to Mexico who happened to be best buddies with a professor of ours, and a life-endangering bridge crossing into Oregon. But the border didn’t stop the rain and we decided to once again call upon trusty internet strangers to provide lodging for the night. Neil, a semi-retired track coach and guidance counsellor from Seaside, OR, was our host. With a ruddy face, a tireless smile, and a knowing wink, Neil let us into his home, immediately offering us full use of anything, “I’m barely home, so use my kitchen, garage, laundry, whatever you need, it’s just sitting there otherwise!” he said. After a quick chat about his own travels, Neil was out the door again, turning to say “Oh and if you leave, don’t worry about locking the door, 99% of people are good, and the others, well you can’t do anything about it anyway so you might as well trust people and be happy.” A wink, a smile, and he was gone. After five minutes with him, we already knew that Neil was something special. After a brief respite from the rain at Neil’s, we found ourselves mentally and physically recharged. We were still fighting a chilly wind and began noticing a subtle change in the colour of the leaves. The seasons were changing and with nothing more than a sweater and a rain jacket each, we knew it was time to pick up the pace and keep moving south. Wet days dribbled into sunny weeks as each turn of the wheels propelled us further south and we soon found ourselves posing in front of the California welcome sign. The moment was complete when a man in a beat up truck saw us awkwardly trying to take self-photos and did a U-turn on the highway so that he could take a picture of us all together underneath the sign. One of the great joys of bicycle touring was how each day turned into a massive game of leapfrog. In the morning, we would pass another group of cyclists (most often retired couples), stop and chat with them a bit before heading on again, possibly see them again at lunch, and then have what would amount to a joyous reunion at night when we both turned up to the same campsite. The reunions were even sweeter when it had been days or weeks since you had last seen one another. In this age of instant communication, it was particularly amazing to me how information would travel up and down the coast simply through people talking to one another. When we came upon another group of cyclists, the traditional greetings were exchanged and we entered into a seemingly scripted dialogue: “Where are you guys from? Where are you going? Do you know ___ and ___? Cool! How are they doing? Where are you staying tonight? Know anything about the weather? How busy is that road coming up?” All the essential information was passed easily through the shared bond of being a hobo on a bike. One time in particular, I found myself receiving a hand written note that had been passed on twice already with exact directions for a particularly tricky detour around a section of road under construction. We entered the majestic Redwood forests of Northern California and spent gruelling mornings climbing 3000 foot hills, and glorious afternoons coasting down along the beautifully paved Avenue of the Giants, winding our way through the thousand year old trees, never needing to pedal. As we neared San Francisco, I began to have doubts about the second portion of the trip. 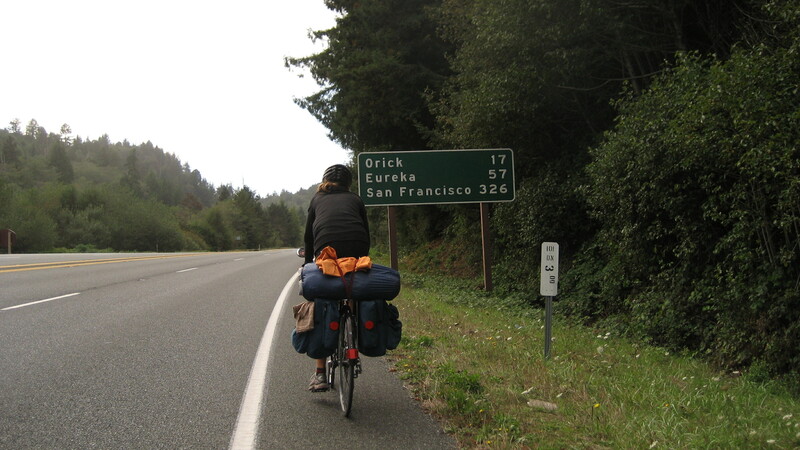 Originally, after we biked to SF, the plan was to ship our bicycles home and continue to travel through Central America by bus, plane and foot. But my appetite for cycling had only just been whetted and I found myself realizing that what I really wanted to do was just keep bicycling. I loved the feeling of having a massive, seemingly limitless expanse ahead of me which I could explore by my very own power; in short, the initial pain had transformed into a desire, in fact a need, for movement, for rhythm, for uninterrupted journeying. In nearly two months of cycling I had become comfortable with the vulnerability and uncertainty inherent in never knowing exactly where you will sleep, eat, or even where you will find yourself the next day. I had started to learn the most important lesson of the journey; that people could be trusted. With this new confidence in myself and the world, I made the Mexican border my new destination and informed my trusty travel companions of the change in plans. Striking out on my own was something beyond consideration when I first started the journey, and now it was quickly becoming a reality. I celebrated my decision by purchasing my very own lightweight tent and shipping home 9 pounds of unnecessary gear. I was now self-sufficient from an equipment point of view, but fear of loneliness lingered in the back of my mind. The big change was coming fast and I resolved to continue the solo journey with the same spirit of openness, vulnerability, and generosity that had made the first part of the trip so life-changing. Part two of Patrick’s story will be featured on Thursday, March 23rd on http://lesleycarter.wordpress.com/ or can already be found at Bucket List Publications Magazine at http://www.bucketlistpublications.com/2012/02/22/reaffirming-my-faith-in-humanity-one-pedal-at-a-time-part-two-san-francisco-to-mexico/. Submissions to lesleycarter.wordpress.com & Bucket List Publications. Submit your travel posts and bucket list adventures along with photography to Bucket List Publications at [email protected]. All authors/photographers whose articles are chosen for publication will receive publication at lesleycarter.wordpress.com and Bucket List Publications Online Magazine, a link to their blog, and a link on my Facebook page Lesley Carter – http://www.facebook.com/LesleyCarterBlog. lesleycarter.wordpress.com has an average of 300,000 views a month, 15,000 followers, and around 20,000 readers a day! Your submissions do not need to be original posts. You can submit already published works as long as they are your own content. I do ask that all submissions are in Microsoft Word format and all photos are sent as jpeg attachments. Please title your submissions with one of the above listed categories. Remember to include your name and a link to your blog at the top of the text. This entry was posted in Bucket List Publications, California, California Outdoors, Travel, Uncategorized and tagged Adrenaline, adventure, biking, bucket list, Bucket List Publications, Canada, landscape, Lesley Carter, life, photo, southern California, touring, travel, USA by lesleycarter. Bookmark the permalink. My hubby, an avid biker, will want to read this 🙂 I’ll forward it along to him. Sounds like a great trip! It certainly was, I was pretty lucky to have the opportunity to do something like this! The thing is, when it’s all said and done, it seems like such a long, crazy trip, but it’s just one day at a time when you are out on the bike. I think one of the best parts about bike touring is its humble nature. Thanks for commenting! Great reading, very absorbing. Great trip indeed! Just finished reading about your trip…I can’t wait to hear about the excursion beyond San Francisco. Thanks! Glad you enjoyed it 🙂 Yes, post San-Francisco things certainly get interesting… stay tuned! I experienced a some-kind of a similar experience where, while traveling through western California by foot, I had to renew my long lost faith in Humanity. At one point, i found myself totally exhausted and in great difficulty… Without even asking, people came and provided me with their help and assistance. Yes, people can be trusted! It’s amazing isn’t it!? The thing that I struggle to do is bring that faith and trust into day-to-day life when I’m not on a trip. I think that in experiences like this the sense of vulnerability really helps to define your reality, and you are that much more aware of how good people can be! Where did you hike in California? Redwood pict is my favorite! I’ve been to some of the places you mentioned in here so I can picture you there. Are you going to continue writing about this adventure? I hope so. I’m wondering if any of the others decided at the last minute to stay with you. This was written in such an interesting way. You definitely have a way with words! Way way back in the ancient year of 1981, I hitchhiked up the east coast of Australia from Melbourne to Brisbane. After a few months working in Mount Isa I flew home to Melbourne and did it all again, this time turning west in northern New South Wales and traveling through to Adelaide. It was a great way to see my country, and set me apart from most of my friends who were more interested in buying their first car at that age. Wow! That sounds like an absolutely amazing trip. I especially like that as soon as you went home you started right back out again! A true traveller! Thanks! What a great adventure! Just reliving a similar journey – solo cycle journey across Canada. Has been the most wonderful experience and I long to do it again! My inspiration actually started after reading about an adventurer who left Vancouver – did the periphery of the US, finishing back in Canada. I have only just started writing about my travels – pop on over if you like. I hope to be able to read more about yours! Your blog looks great Anita! Great to hear from a fellow tourer 🙂 I would really love to go across Canada one day, I kept thinking on my own trip that the only thing that would make it better was it being my own country I was crossing. But it is certainly something wonderful to look forward to! Cheers! I really enjoyed reading your story and felt a small pang of envy at your experience. The whole things sounds wonderful. And it really is nice having your faith in humanity restored time and time again. Thanks so much! Glad you enjoyed it. Yes, I was very blessed to have this opportunity. One of the best things about bike touring is the fact that you have so much time to just think. It can really help you to focus and remain mindful, especially when there is so much to be grateful for! 🙂 You must be very grateful yourself to be living in such a beautiful place, I loved San Francisco. Cheers! Yes, bike touring would give you an abundance of time to “sit and think!” 🙂 I read a book years ago about a man who walked across America and that was very interesting, so your adventure would bring similar experiences…meeting new people, accepting help and trusting others (I love your humor, by the way. but understandable). Anyway, I will check out your blog and if you enjoy poetry, please visit me, as well, lscotthoughts.com. All the best in your adventures! It sounds like you had a great trip! I very much enjoyed reading about it so thank you for sharing. Gosh you are brave! What a wonderful adventure. This has made me think about stepping out of my comfort zone of supported touring and taking the road less traveled by myself and my husband. Thanks for the inspiration! That’s wonderful to hear! I would be really interested in knowing what you thought of both experiences, if you do end up going it ‘alone’! Any routes in mind? Loved the story. 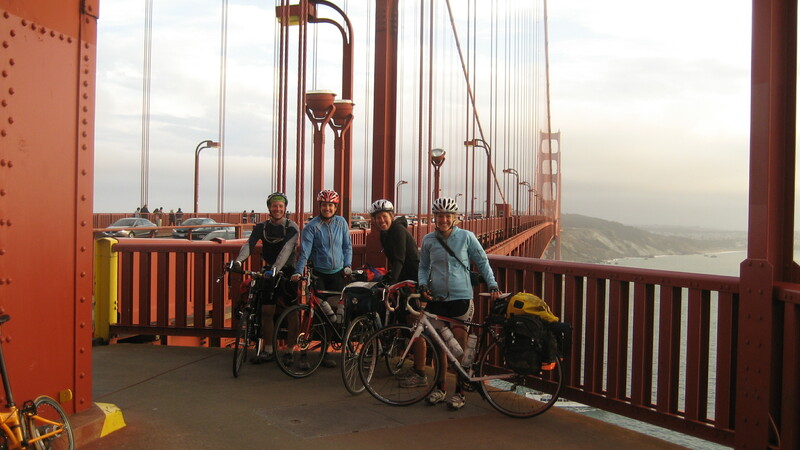 I biked with eleven buddies from the Oregon border to San Francisco back in 1967. I was 16, and it was a fun journey. Thanks for your comment! Your trip sounds amazing! It must have been quite a challenge to ride with that many people, I wonder how many times you guys had to stop for flat tires! really enjoyable and well written post Lesley! thanks for the account of your trip! Awesome post and congrats, that is truly inspirational! Wow .. Everyday would have been so fulfilling !! wow! what an awesome trip! and so encouraging! i can’t wait to hear the rest of your story. thanks for sharing! That’s great, thanks Nelson! I will definitely be checking out your site as well. 10 minutes well-spent … thanks for the inspiration, as I will have to do this someday very soon! I’m glad you liked my story, thanks for commenting! Yeah…Washington was definitely one of the tougher sections of the journey, but at the same time very rewarding and so.many.kind.strangers! Whoops. :”) Omg, I totally didn’t read who the writer was.. Gosh, I’m embarassed. Still inspired, though. 😉 Haha! I went to School in North California at Dell’Arte International School of Physical Theatre in Blue Lake. I Bet you biked right by it! Very cool! 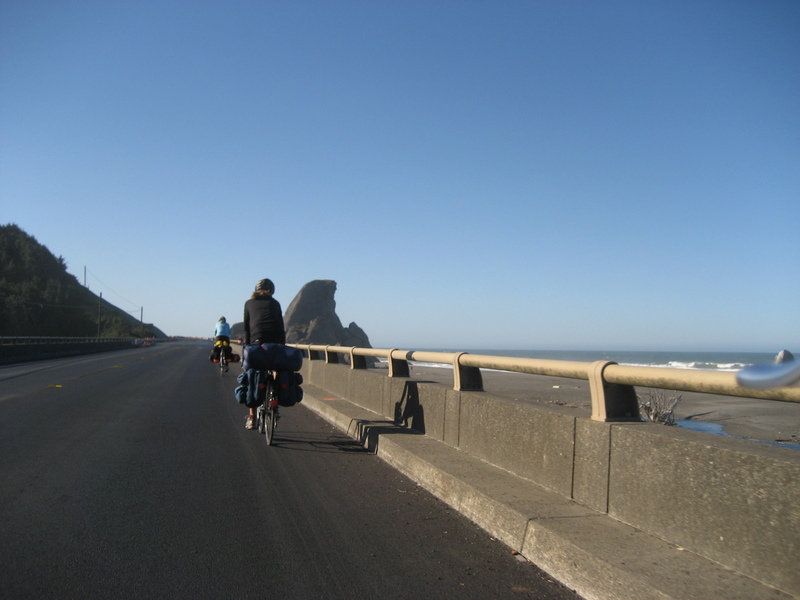 I stayed at the KOA campground just outside of Arcata that night, pleasant memories from a fun-filled evening with many other bicyclists! Thanks! 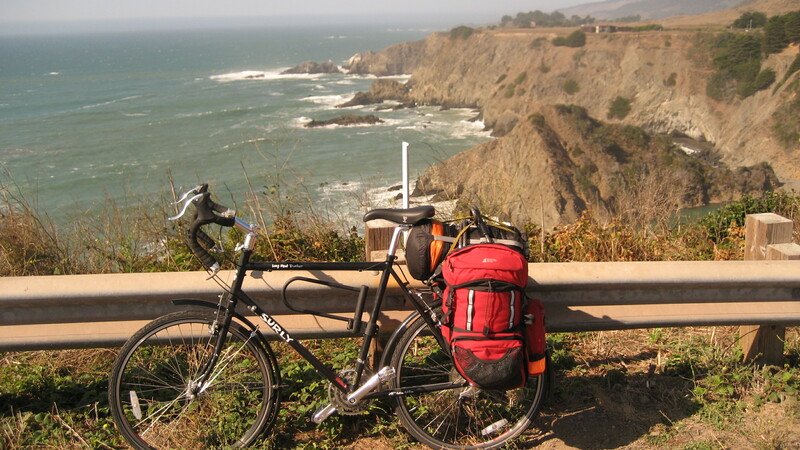 It was, at times, literally FLIPPIN… Once I went over the handlebars and had to go to the emergency room in Gold Beach, OR. Patrick, what a great experience and an important message. Fear is rarely a productive emotion and, too often these days, the idea of mistrust of others is emphasized as necessary. Your host in Seaside – Neil – really gives us all a mantra for our lives. You might as well trust people and be happy because the 1% you can’t trust, you can’t do anything about. I’ve had innumerable positive experiences through approaching people with the assumption that they’re good and few pleasant ones approaching people assuming they’re bad. We might as well live positively for all our sakes. Thanks for a great travel tale with a really important philosophy. Thanks for your thoughtful comment, Alison! You’re completely right, there is a way too much fear in society. I’ve done a bit of work on this for my studies and it is really interesting to see how our perceptions of dangers in no way match up with the reality. And to think of all that we are missing because of fear! In my opinion, it’s all about being aware of risk and managing it appropriately. I like pedalling, i like the redwoods. And I like the west coast of the States you had peddaled along. Great post. Thank you. Thanks! Indeed, all three are wonderful things! What an amazing achievement! I admire your spirit! What an adventure! Great post! Letting go of our perceptions and fears can be difficult. Your journey has made many realize that people are generally caring and good. We should all learn to relinquish our fears and take to the road just as you did – bravo! By the way great writing – I hope you have a second part to this. Thanks very much! Second part is on the way soon, here’s the link to my blog if you’re interested in more writing. I love this article. What an incredible journey! Wow and wow again! As a cyclist myself, I salute you and marvel at your determination. Thanks Bruce! Any tours on the agenda for yourself? What a great way to see the countryside! I love the slower pace of bike riding. It’s amazing what you miss while driving but on a bike you can actually enjoy all that is around you, the smells, sights and sounds. Great guest post. I just checked the mileage on Google Map. You and your crew are insane, and I am envy of you. haha I will definitely take that as a compliment! Inspiring. I enjoyed following the blossoming of your trust, in your idea and yourself, then in others. This was truly a life adventure. I was inspired by your faith that all you needed to do was to start the trip. You have shown that dreams can be realized as long as you try. Sounds like you had an amazing tip. Have to admit I respect your guts to make suich a trip in the first place. 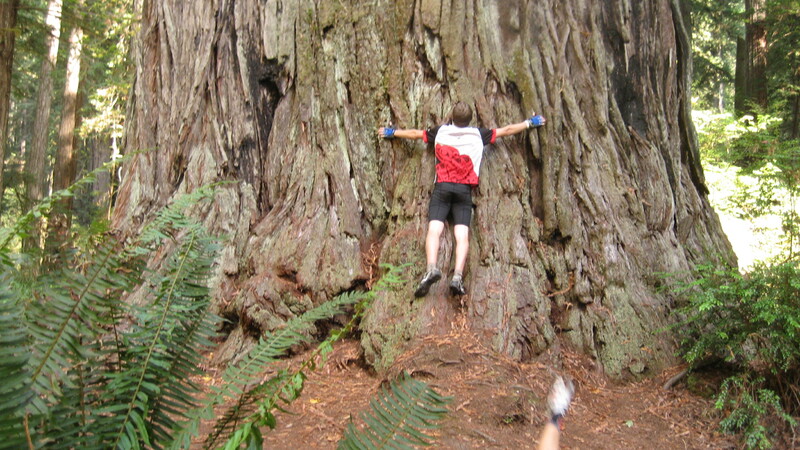 My favorite photo here is the one hugging the redwood tree! And I would have probably had about 20 flat tires on this Canada-to-Mexico trip. But what a wonderful way to truly immerse oneself into the far western parts of North America! Sounds so amazing!! I want to try to bike the MS300 from Houston, Tx to Austin, Tx soon!! !